A BALE HAULER AND A FLAT DECK IN ONE. Ag Shield's Multi-Trailer is the most valuable fifth-wheel trailer available for hay producers. Our patented design gives you the ability to haul equipment at one point and to haul/dump round bales the next. This two-in-one capability saves time, labor and money. Ultimately the Multi-Trailer helps you maximize efficiency on your farm. Ag Shield's Multi-Trailer offers you unmatched versatility with the ability to quickly change the trailer's configuration from flat-deck to a round bale hauler. 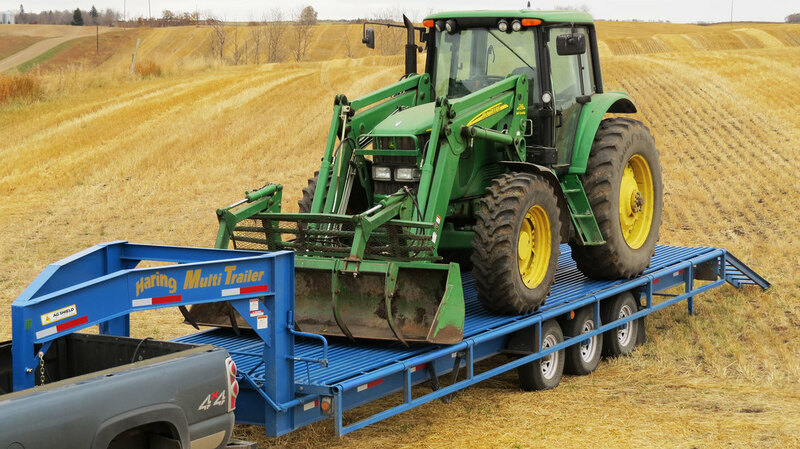 With the Multi-Trailer you can haul 20,000 lbs of anything that you want; tractor, ATV(s), bales (round or square) and any other flat-deck load. Not only can the Multi-Trailer haul for you, but in Round Bale mode, the Multi-Trailer can also dump the bales on into neat rows on your field/yard. The Multi-Trailer is effectively a one-man bale hauling system. A tractor can be hauled to the field and unloaded. Once the tractor is unloaded, the driver raises the deck racks and side rails into the Round Bale position. The driver loads the bales onto the trailer using the tractor. He/she can then drive the loaded bales to the drop point, utilize the dump system and return to load up the tractor. This can all be done by one person! When you invest in an Ag Shield Multi-Trailer you get both a flat-deck and a round bale hauler at the same time. There is no need to buy two types of trailer for your farm. The Multi-Trailer is all you need. With the Multi-Trailer, you only have one trailer to maintain. If you look at the total cost of a Multi-Trailer vs. the cost of a flat-deck trailer AND a bale hauler, the value is clear. Ag Shield's Multi-Trailer features a unique deck design that allows for the trailer to be easily configured as a flat-deck or as a bale hauler by the user. 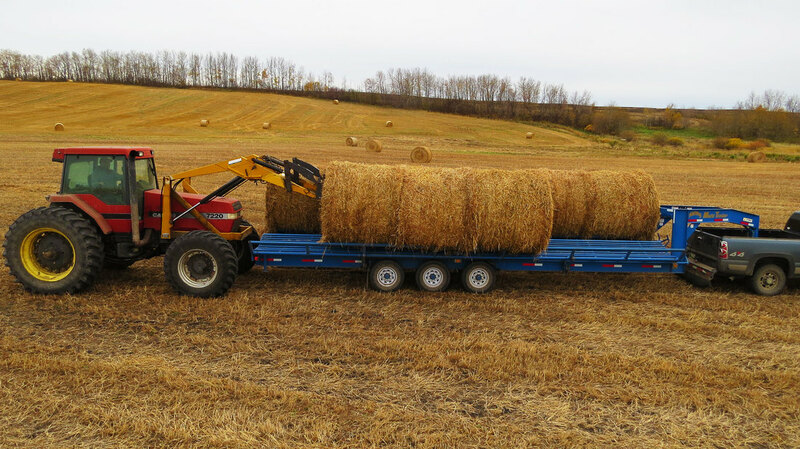 Simply lift up and lock the guard rails in place on either side of the trailer and then angle the two hinged deck sections in order to achieve bale hauling capability. This process takes as little as 45 seconds. When a flat-deck is needed, lower the raised deck sections and either keep raised or lower the guard rail sections depending on your need. Organizing your bales in rows has never been easier! 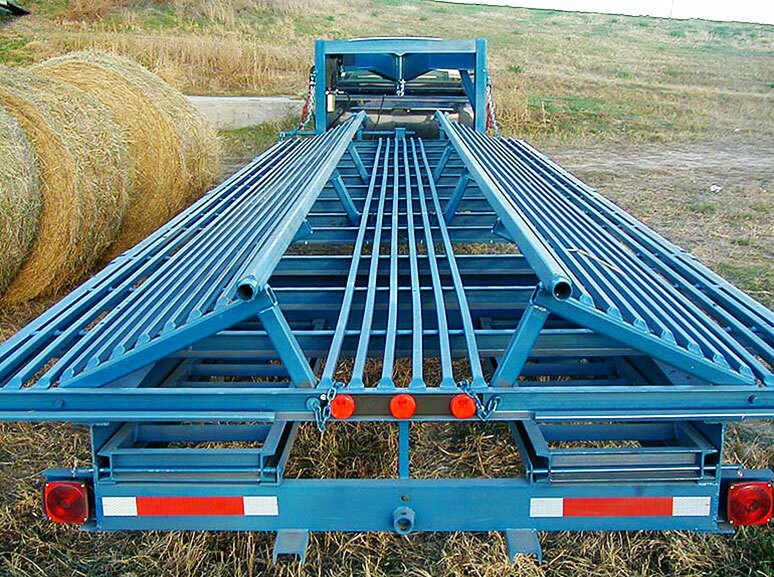 Simply load your bales into either of the two "chute rows" on the Multi-Trailer. ​Loading is done from the back of the trailer and each additional bale is pushed along the "chute row" without the need for a grapple. When both rows are loaded, the operator can drive to and align the trailer alongside the desired drop point. The operator simply releases the safety locks and pulls the lever to drop the guard rail. This causes the designated row of bales is dropped off of the trailer into a neat, weather-tight row. The operator can then turn around and align the other row of bales and perform the same action. This makes moving your bales faster, cheaper and safer than ever before. All Ag Shield Multi-Trailers come standard with loading ramps. Each ramp supports 11,000lbs per axle and is 7' long providing a reasonable slope. Both ramps are able to easily slide under the frame for transport/hauling. The Multi-Trailer also features two rear stabilizers for trouble free loading.